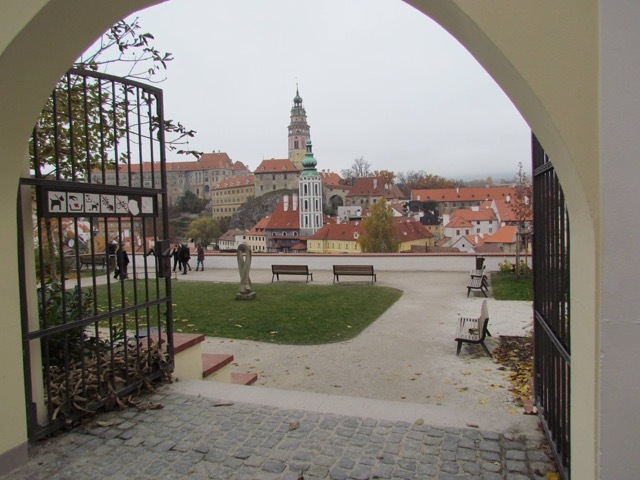 Cesky Krumlov is one of the most beautiful small towns in Europe. Rich in history and architecture, it has been designated by UNESCO as a world historical monument. Although largely forgotten in the West until recently, it was the center of alchemical study during the Renaissance under the guidance of Count Wilem Rozmberk. Idyllically situated in a valley in the Blansky Forrest and encircled by the crystal clear Vltava river that you can see from just about every vantage point, this town will delight you with its little old town square, gardens, and lovely restaurants dotted along the river. We will spend our day walking through the township, taking in the rich evocative atmosphere of old Bohemia, with its winding cobbled streets, viewing the ancient medieval buildings and small alleys that transport us to another time and another place! It almost feels like the upheavals of European history of the past few hundred years have passed it by. We will a have guided tour through the spectacular 13th century castle “Krumlovsky Zamek” known as the “Pearl of the Renaissance” and learn the history of the Czech noble Vilem Rozmberk who was born on March 10, 1535, in Schützendorf Castle in Austria. His parents ranked among the most powerful and influential people in the Austro-Hungarian Empire and held castles and properties throughout the north central section of the realm. Wilhelm, their oldest son, was educated at a private school in Bohemia and spent the years from 1544 to 1550 at a bishopric college in Passau. After finishing his studies, he went to Vienna and was welcomed into the court of emperor Ferdinand I von Habsburg. Later, when Rudolf II took power, Vilem became a diplomat in his court. He would also become the highest royal officer in Prague in the service of emperor Maxmilian II. This full cycle, brings us back to the birth place of the International Alchemy Guild that Aurelius, our alchemy teacher currently belongs to. This modern Alchemy Guild grew from a small group of practicing alchemists from Austria and Czechoslovakia who began holding informal meetings in Vienna in the 1970s. Members of this group traced their lineage back to Wilhelm von Rosenberg, a sixteenth-century nobleman who founded a group of freethinking alchemists made up of both spiritual and practical alchemists, as well as any of their fellow craftsmen who had been outcast or persecuted by political or Church authorities. We will visit the biggest Rozmberks' castle "Rozmberk" and the two fantastic monasteries Cistercian Vyssi Brod and Zlata koruna and the nearby beautiful labyrinth. We will also visit the Moldavite museum, an incredible display of the 15 million years old moldavite olive green crystals which were formed by the impact of a giant meteorite. Most of the rocks, melted by the impact and cooled while they were airborne, fell in central Bohemia. Some say, this is the prime reason that alchemy developed in this land, long before anywhere else in the world. Did the ancient alchemists use moldavite as part of their “Philosopher’s Stone? Is this the reason John Dee and Edward Kelly and so many others where attracted to Bohemia? Be sure to ask our traveling alchemist Aurelius Electrum this vital question when you are here with us in Cesky Krumlov! This is also where your poor author of these notes, Roger Green, had a powerful “I have been here before’ deja vu experience one evening in 1996, traveling to Cesky Krumlov for the first time from over the border from Austria, visiting one night for dinner with his Feng Shui students. He new then he had a deep relationship to the land of the Bohemes (the old tribe was called Bois or Boji) and has been teaching and working there ever since!